Consider the concept of access. If you want to spend the day running, join a health club. If you want to enjoy an efficient and pleasurable cooking experience, put some thought into the organization of your workspace. The design of the cooking area should be practical. You shouldn’t have to walk ten feet from the stove to get the salt, for example. Figure out the easiest routes between work areas. You should be able to move from your sink to the stove and to the refrigerator in a smooth, unobstructed fashion. This working space actually has a name: the kitchen triangle. 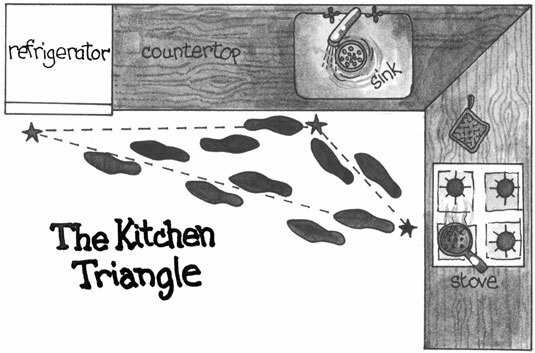 Sink-stove-fridge: Make sure the route through your kitchen triangle is clear. Move any kitchen obstructions you can. If a table, plant, or small child is blocking the way, move it. Even if you can’t design your kitchen space, you can arrange what you need in a way that works for you.